You'd think that after no less than nine Mario Party outings on home console, the red-hatted plumber would be a bit tired of the endless party. Fortunately for Wii U owners, that couldn't be further from being the case! As you'd expect from the series, Mario Party 10 packs in a host of new game boards and mini games. Players work their way around the game boards, competing against friends and family in over 70 different challenges. They might involve dodging ghosts, enjoiying a spot of golf or firing rockets at poor old Yoshi, with competitive but co-operative boss battles make a return. One of the big new features is amiibo functionality. Tap in any compatible figure and you can open up amiibo Party, which puts your amiibo onto the game board as a piece. Play across a board with Mario, Luigi, Yoshi and more and experience a raft of new features. Also new to the series is the 1 vs 4 Bowser Party mode. Using the gamepad, one player will stomp, bash and blast through minigames attempting to destroy Team Mario. The other four players, meanwhile, must work together to stay one step ahead of the big baddie! 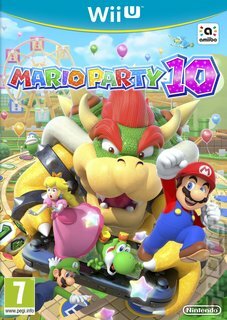 Then, of course, there's Mario Party mode in which players ride together around the board together, competing for Mini-Stars while staying on guard for caged-up characters and last-minute surprises!